"In his article, the archbishop argues that as well as the death toll, there has been a heavy moral cost to civilisation, with no gain. ...Even greater costs have been exacted beyond the killing fields, in the hardened hearts and minds of members of the human family across the world. "'Has the potential for terrorist attacks decreased? To what extent have we succeeded in bringing the so-called Muslim and Judeo-Christian worlds closer together, in sowing the seeds of understanding and hope?' Blair and Bush, he says, set an appalling example. 'If leaders may lie, then who should tell the truth?' he asks. Blair attempted to reply to this withering blast, with his best "more in sorrow than in anger" shtick, but he only compounded his moral nullity with his defense. He offered, as usual, the facts that Saddam Hussein was a tyrant who violently oppressed his people -- a situation that has long obtained in many countries around the world (including many of Tony's pals in the Middle East and Central Asia, who pay him so handsomely for his "counsel"). And of course, this oppression had nothing to do with the repeatedly stated "reasons" for the attack offered by Bush and Blair: that Iraq's non-existent weapons of mass destruction posed an imminent threat of attack on Britain and America. 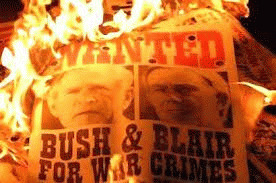 The knowing falsity of these pre-war charges has been confirmed in a multitude of quarters, but Blair, with the irreality of the genuine psychopath, now claims the opposite, saying ... "the old canard that we lied about the intelligence is completely wrong as every single independent analysis of the evidence has shown." The fact is that every single independent analysis of the evidence has shown the complete opposite: that high officials throughout both governments were well aware of the weakness and falsity of the "evidence" of Iraq's WMDs, and that these weak reeds were bent and shaped to fit the policy approved by both leaders: to invade Iraq, come hell or high water. I must admit that, old cynic that I am, even I was taken aback by the brazenness displayed here. Blair was in power for six years of the US-UK sanctions regime against Iraq. He is just as complicit as Clinton and both George Bushes in the deaths of hundreds of thousands of innocent children (and adults) who perished as a direct result of the devastating sanctions, which denied Iraqis most of the basic elements of life. If Iraq's economy really is "three times larger now" (that is, assuming this smiling, unctuous, super-Christian liar is not lying in his usual lying manner), it is because it is starting from the "Year Zero" level imposed on the ordinary Iraqi people -- by Tony Blair himself, colluding with his bipartisan masters in Washington, Clinton and Bush. Blair himself helped grind the Iraqi economy -- and the Iraqi people -- into the dust. And now, after launching a war of aggression against the country which killed a million more people, he takes credit for the "improvement" from lifting the sanctions he himself imposed and sternly policed. Surely this breaks new ground for war criminals. Not even Adolf Hitler claimed that his murderous invasions were "good" for the Poles and the Russians and the Jews, that by launching baseless wars of aggression and killing hundreds of thousands of innocent people he was somehow doing them a favor. But Blair, like Bush and Clinton -- and like Obama and Romney and the rest of the American political class -- insist that their murders and invasions and black ops and sanctions are altruistic missions of mercy to the very people they are killing or strangling.